StubHub is back again at SXSW 2018, bringing their strong cast of bands to Banger’s Sausage House & Beer Garden on Austin’s Rainey Street! 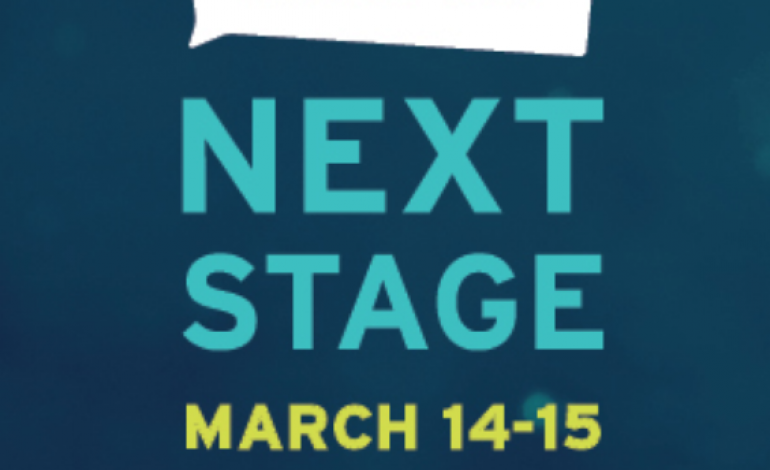 Partnering with Collide, the StubHub Next Stage brings 18 bands to Banger’s from Wednesday until Thursday. Day shows are all ages and free with RSVP, but night shows are 21+ only and should require official SXSW badges or wristbands for entry. Either way you’ll be more than properly entertained – the day parties include shows from LA-based modern Americana group Mt. Joy, with their self-titled debut full-length album debuting on March 2nd just days before the show, electro-indie-pop morgxn just days before he starts a European tour, multi-talented multi-instrumentalist new funk legend Joey Dosik who you may know as a member of Vulfpeck, the modern, darker folk/pop of Liza Anne who’s also releasing her latest record Fine But Dying on March 9th, and far more! Attendees who can stay for the night shows will be treated to a high-energy show from Queens native chef-turned-big-name-rapper Action Bronson, San Diego surf rockers WAVVES, their fellow southern California indie rock superstars Cold War Kids, and far more! Read on for full event details, full list of bands for each day, and the ever-important link to RSVP! RSVP at culturecollide.com/stubhub and rock up as early as you can, events on Rainey St. reach capacity quickly. Remember, RSVPs are only good for the day shows, and of course entry is always subject to capacity. The free day shows on Wednesday, March 14th start with pop newcomers lovelytheband at 2pm, morgxn at 3pm, Israeli indie pop group Lola Marsh at 4pm, Lawrence at 5pm, and end with Joey Dosik at 6pm. 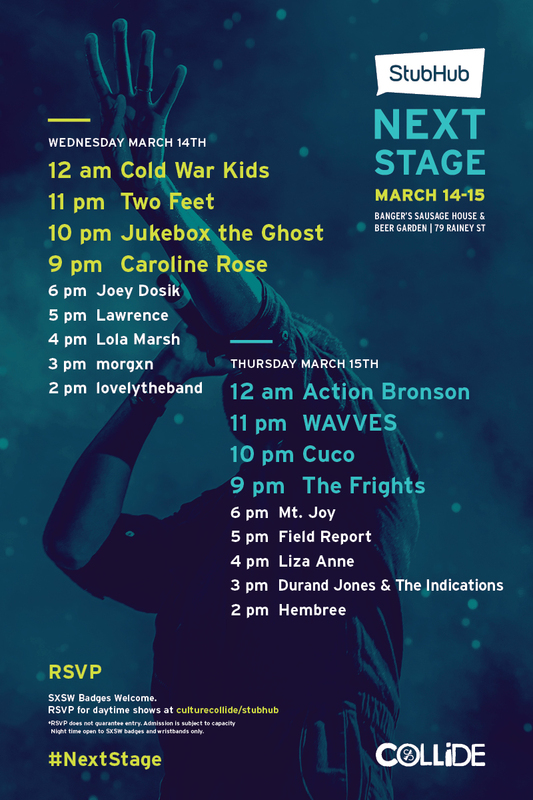 The night shows kick back in for those with official credentials with Caroline Rose at 9pm, Jukebox the Ghost at 10pm, Two Feet at 11pm, and Cold War Kids at 12am. The free day shows on Thursday, March 15th start with Missouri modern rock group Hembree at 2pm, soul upstarts Durand Jones & The Indications at 3pm, Liza Anne at 4pm, Field Report at 5pm, and end with the foot-stomping good time of Mt. Joy at 6pm. Official night shows start back in at 9pm with surf punk trio The Frights, then LA synth wunderkind Cuco at 10pm, WAVVES at 11pm, and Actin Bronson to finish the night coming on at 12am.